A number of scientific, engineering, and cybersecurity tasks need random data. We need them for scientific applications including Monte Carlo methods for simulating complex physical processes. We need to generate random noise signals in order to test digital signal processing techniques. Finally, several cryptographic tasks need unpredictable, thus unguessable, data. These include long-term RSA and ECC key pairs for SSH and PGP, one-use-only session keys for encrypting SSH and TLS/SSL connections and for encrypting stored data, and the initialization vectors used for the various chaining and feedback modes of symmetric block ciphers. The problem is that a computer is a completely deterministic device. If you run the same program multiple times it should do the same thing each time. Otherwise it would have a serious problem. A computer program is instead a pseudorandom generator. John von Neumann said "Anyone who considers arithmetical methods of producing random digits is, of course, in a state of sin." An older way of generating a pseudorandom sequence on a Unix-family operating system (Linux, BSD, Apple OS X, Solaris, etc., is to first seed the sequence generator with srand() and then repeatedly call rand() to obtain the sequence. The problem is that the output is too regular. As the GNU manual page explains, rand() and srand() first appeared in Version 3 AT&T UNIX and conform to ANSI C89 (ANSI X3.159-1989). The low dozen bits go through a cyclic pattern. Things were different then. The functions srandom() and random() seed and then generate a sequence with much better characteristics. The GNU manual page for random() explains that it uses a non-linear additive feedback random number generator with a period of approximately 16×(231-1) or 34,359,738,352. For Monte Carlo simulations or digital signal processing, you just need pseudorandom data with the desired distribution. In fact, it may be preferred because you get the same sequence every time you start with the same seed. However, security applications need truly unpredictable random numbers for purposes including the generation of cryptographic keys. This leads to the concept of a cryptographically strong pseudorandom number generator, something that makes it adequately difficult to predict the next values even after observing the sequence so far. These unpredicatable sequences could be used to generate long-term SSH keys for servers and users, SSL keys for servers, or the session keys used to encrypt sensitive files or e-mail messages. A more mundane (and therefore frequently overlooked) need is for unpredictable TCP initial sequence numbers and DNS transaction ID numbers. The TCP risks were pointed out by Robert Morris in 1985 and Steven Bellovin in 1989, but we still had problems into the 2000s with operating systems implementing TCP in a way that allowed attackers to hijack connections. The DNS problems are more recent, with RFC 5452 suggesting some interesting extensions. The Linux kernel data structures in /proc/sys/kernel/random/* provide an additional interface to the /dev/random device. The read and write wakeup thresholds can be changed by writing to those files, the other values are read-only. All can be read by cat or sysctl. boot_id Random string generated at boot time. entropy_avail The number of bits of available entropy. poolsize The size of the entropy pool, the maximum size of entropy_avail. read_wakeup_threshold The number of bits of entropy required for waking up processes that sleep waiting for entropy from /dev/random. uuid Random UUID string generated afresh at each read. write_wakeup_threshold The number of bits of entropy below which we wake up processes that do a select() or poll() for write access to /dev/random. Below we check on the random devices available in various UNIX-family operating systems. All have random and urandom pseudodevices. The FreeBSD system is running on a platform with an Intel Secure Key RNG chip. That is used for both devices. OpenBSD is the odd one with its additional arandom and srandom. All of the OpenBSD devices have unique minor device numbers, but I think that they all use the same underlying arc4random algorithm. All four on OpenBSD are very fast and highly random. If your CPU or motherboard has a hardware random number generator, the corresponding Linux kernel module can create a random device. For example, you can buy a TPM or Trusted Platform Module for about US$ 12–16 from Amazon. With kernel support, there is now a /dev/tpm0 and /dev/hwrng. The second of those is continuously read by the rngd daemon to feed entropy to the kernel. The screenshot shows the graphical configuration tool used to define a kernel build. See my kernel building page for details on configuring, building, and installing a custom kernel. The build configuration process is hardware specific. Here you see a kernel build being configured on AMD64 hardware, where these five hardware RNG devices may be found. The result is one or more kernel modules in /lib/modules/release/kernel/drivers/char/hw_random, including the following on IA64/AMD64 platforms. Selecting hardware random number generator support under Device drivers ⇒ Character devices in the Linux kernel build configuration. 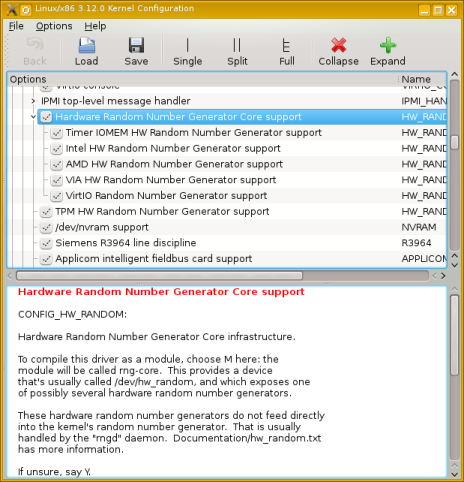 Add the rng-tools package to fully take advantage of the hardware random number generator. You will also need to add the kernel module bcm2708_rng to the list of automatically loaded modules in /etc/modules. IC2 is the SoC and RAM. It's the large module (12.5×12.5 mm) in the center of the board, between the yellow RCA connector and the orange-topped HDMI connector, to the right of the "Raspberry Pi" logo. The Samsung SDRAM is stacked on top of the Broadcom BCM2835 SoC. You could edit /etc/default/rng-tools to specify the hardware device, but as a comment in that file warns, you should just leave that commented out so the boot script will know to auto-detect the device. The daemon will be automatically started after the next boot, although of course you can manually start it right away. On Pidora, this would be a matter of enabling and starting the rngd service with systemctl. With the rngd daemon running, it reads from the hardware RNG /dev/hwrng and feeds that entropy into /dev/random. Broadcom has not released any detailed documentation on their hardware random number generator, but this is better than nothing. It shouldn't make things any worse, because it is just being used as another source of entropy by the Linux kernel, and it should make things better. The Raspberry Pi does not have any traditional disk controllers, leaving it without the typical good sources of entropy. It would make sense that the Broadcom hardware devices works somewhat like the urandom device, generating output even when it has run low on entropy and the result becomes less random. Broadcom designed the device for use in telephone handsets, generating GSM and 3G/4G session keys. Users would not find it acceptable to have to wait through mysterious math-based delays before placing calls. How Random is the Result? Analyze your random data with the ent program from John Walker, the founder of Autodesk and co-author of AutoCAD. On Linux add the option iflag=fullblock, and on Linux on x86_64 be ready to wait for a long time for the random device. It took several hours to collect one megabyte. However, see the above discussion of how much random data is really needed. A one-time pad is the only perfectly secure cipher, but it is an enormous bother to use one. If you really care enough to use a one-time pad, then it makes little sense to use a program (including kernel modules) to generate it. To really do randomness correctly, use physics. The Australian National University has built a quantum optics random number generator and you can even download a unique live random number stream from their system. A pseudo-random number generator (PRNG) is a deterministic algorithm that produces numbers whose distribution is indistinguishable from uniform. A formal security model for PRNGs with input was proposed in 2005 by Barak and Halevi (BH). This model involves an internal state that is refreshed with a (potentially biased) external random source, and a cryptographic function that outputs random numbers from the continually internal state. In this work we extend the BH model to also include a new security property capturing how it should accumulate the entropy of the input data into the internal state after state compromise. This property states that a good PRNG should be able to eventually recover from compromise even if the entropy is injected into the system at a very slow pace, and expresses the real-life expected behavior of existing PRNG designs. Unfortunately, we show that neither the model nor the specific PRNG construction proposed by Barak and Halevi meet this new property, despite meeting a weaker robustness notion introduced by BH. From a practical side, we also give a precise assessment of the security of the two Linux PRNGs, /dev/random and /dev/urandom. In particular, we show several attacks proving that these PRNGs are not robust according to our definition, and do not accumulate entropy properly. These attacks are due to the vulnerabilities of the entropy estimator and the internal mixing function of the Linux PRNGs. These attacks against the Linux PRNG show that it does not satisfy the "robustness" notion of security, but it remains unclear if these attacks lead to actual exploitable vulnerabilities in practice. Finally, we propose a simple and very efficient PRNG construction that is provably robust in our new and stronger adversarial model. We present benchmarks between this construction and the Linux PRNG that show that this construction is on average more efficient when recovering from a compromised internal state and when generating cryptographic keys. We therefore recommend to use this construction whenever a PRNG with input is used for cryptography. Read the wonderful reader comments about the RAND book, the best content on all of Amazon.com. "The Linux Pseudorandom Number Generator Revisited"
"Mining Your Ps and Qs: Detection of Widespread Weak Keys in Network Devices"